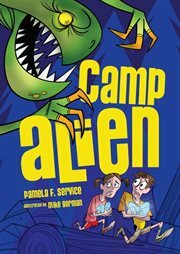 The item Camp alien : alien agent series, book 2, (electronic resource) represents a specific, individual, material embodiment of a distinct intellectual or artistic creation found in Austin Public Library. Zack looks normal, but he's really an alien agent-in-training. He was brought to Earth to help guide the planet into the Galactic Union. Can he retrieve a bunch of alien eggs before they hatch, without any humans finding out?